Is your inner child calling to you, begging to be set free? Maybe your inner child is already at the wheel? Send them our way because Bookmans does not play around about playing around! 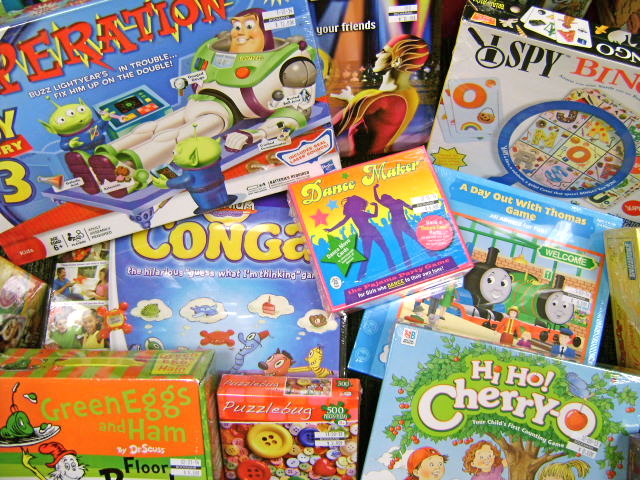 We have the latest and most popular board games* that will test your skill, hone your reflexes and scatter your brains. Ever heard of A Day with Ziggy, Hoopla, Stir Crazy or Last Chance? Remember the classics like Life and the Wizard of Oz trivia? Take Scrabble to the next level with Upwords or hunt for stolen treasure with Artifact. Do you like scandal and intrigue? Try Power Barons, the game of high stakes international rivalry. Go green with Earthology where players buy property and collect carbon credits then trade them for clean air. Play in a foreign language with the German Asian strategy game Der Weibe Lotus. Looking to take it up a notch this weekend with your rowdy friends? How about Frank Bresee’s exciting adult game Pass Out or have a laugh with The Joke Game where you can guess or make up your own punchlines. The battle of the sexes rages on with Chauvinist Pig and both sides win with the Dating Game. If you want to unplug from your TV and internet but still love your favorite shows, check out Simpson’s Jeopardy, the I Love Lucy Game, desktop Mad Men and CD Glee board game. If the little ones are still awake, engage them in a game of Casper the Friendly Ghost or Twister. Dora the Explorer, Chutes and Ladders and Candy Land are always sure to interest the tiny ones in your life. Many games are designed to educate as well as entertain. Try Scrabble Alphabet Game or several math and counting games. Bookmans Speedway also has public play events like Choose your Challenge and coming soon our Pokemon Pile Up. There is always fun to be had at Bookmans. Grab your family or a few friends and get a game together. Or check our event calendar to learn when you can enjoy in store play! We host events at all of our stores and they are always free. Game on at Bookmans! * If you are looking for a particular game rather than just browsing, give the stores a call to make sure we have one on our shelves. Do you have the board game LIFE? And if so how much? Because we don’t maintain an electronic inventory, the only way to find out if we have a certain item is to check the shelves. Give your nearest Bookmans a call. They can tell you if they have Life, request a transfer from another store if they don’t and put it on hold for you.